This is just a reminder that I have a new website, East End Taste. I regular hold national giveaways on my new site. Please have a look! 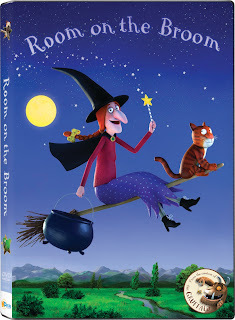 I am happy to review the beloved children's DVD, Room on The Broom, based upon the #1 best-selling children’s picture book written by Julia Donaldson and illustrated by Axel Scheffle. This award-winning animated film also brought you the Academy Award nominated The Gruffalo and The Gruffalo’s Child. 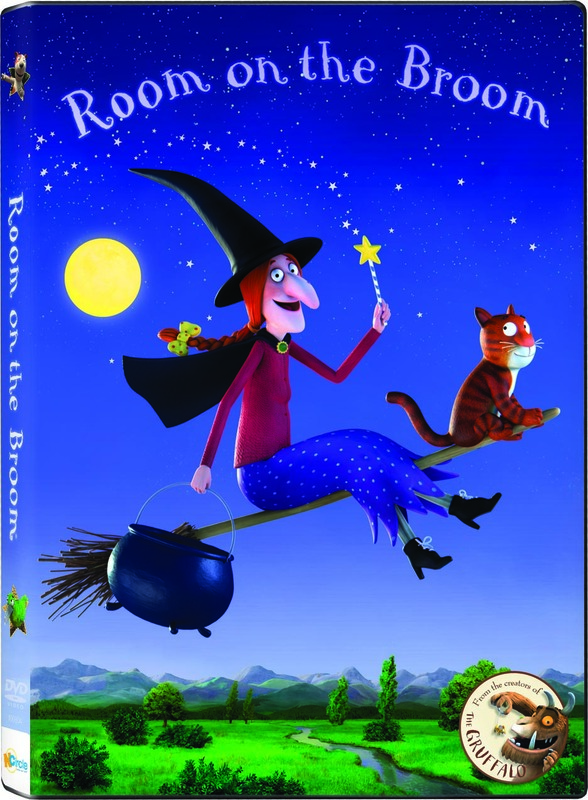 "In this tale of friendship and adventure, join a friendly witch and her cat as they fly happily through the sky on their broomstick—until the witch drops her hat, then her bow, then her wand! Luckily, three helpful animals—a dog, a parrot and a frog—find the missing items and all they want in return is a ride on the broomstick. But is there room on the broom for so many new friends? The kindly witch thinks there is—much to the frustration of her cat. But when disaster strikes, and the witch is about to be eaten by a fearsome dragon, she is saved by the gang of animals, all working together. The witch’s cat learns the importance of friends and family, and the witch rewards her new friends with a magnificent broom that is big enough for everyone!" The DVD was very fun and entertaining, an excellent choice for young children. The story line is very well written and the ending teaches children the important lesson of sharing, helping and looking out for others. This is also a great movie for the classroom. As a tutor and ESL instructor, I intend to show this movie in mid October to my young students in grades 1-2; I am sure they will love it! If you are an educator like myself, at the link below you will find fun-filled and educational activities based on this endearing story available for FREE on NCircle's website: www.entertainmentthateducates.com. I have a recipe below to share with you! Please have a look and let me know if you decide to make it at home and how you enjoyed it! 1/2 C of unsalted butter, softened. Plus about a teaspoon for the griddle. 1. Prepare butter: in a mini-food processor, blend together butter, powdered sugar, and fresh strawberries. Remove strawberry butter from food processor into a separate small bowl. Cover bowl with plastic wrap and keep cold in fridge until french toast is done. 2. Preheat griddle to about 350 degrees. 3. Prepare french toast batter: in a large, flat bowl (I usually use some kind of square tupperware), whisk together milk, eggs, extracts, and cinnamon. 4. Melt extra butter on griddle. 5. Dunk slices, one by one, in french toast batter (both sides), and lay on hot griddle, until all slices are on griddle (mine fit about 7ish slices). 6. When the side-down shows a bit of golden color, flip each slice to the other side (about a minute or two). Remove from grill when the other side is golden as well. 7. Serve with fresh strawberry slices and your homemade strawberry butter. Take a look at my website below. You can direct any questions there. I will be hosting two giveaways around Memorial Day Weekend!! Be sure to take a look. I will remind you here as well when they are up! In celebration of Dr. Seuss' birthday on March 2nd, NCircle Entertainment has provided me with the opportunity to host a book/DVD review and giveaway. One winner will receive the Safari So Good DVD. Did you know that The Cat in the Hat Knows a Lot About That! Is based off of the Random House Cat in the Hat Learning Library book series? Each Cat in the Hat episode teaches kids cool science facts, like how whales communicate or why penguins can’t fly. 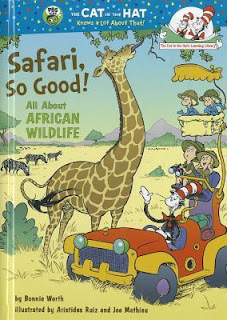 The newest DVD, Safari So Good, is based off of the book with the same title. Explore the jungle and learn about African wildlife when you and your child read together, and then see the book come to life on DVD! Martin Short is the voice of the Cat, and the DVD is filled with music and funny antics. Brand-new from The Cat in the Hat Knows a Lot About That! comes a jam packed DVD full of adventures to exotic savannas and jungles for some monkeying around! We would love for you to review Safari, So Good! in celebration of Dr. Seuss' birthday. 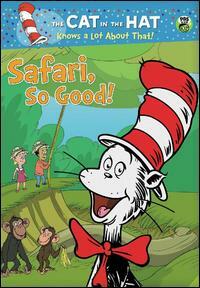 Join the Cat in the Hat on this brand-new safari adventure! Help him find the missing stripes for his hat, swing with silly monkeys and discover how footprints are made! It's time for safari, so come and explore with the Cat and his friends on adventures galore. We will reach for the treetops and swing through the trees, When we walk like giraffes and swing like monkeys! Featuring the voice of Martin Short, this is a fun and enriching DVD that everyone in the family will enjoy. 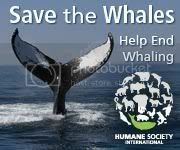 As an animal lover, I love watching anything to do with adorable and fascinating animals. I even learned a ton of new information from the DVD. There is a great amount of vocabulary that your children will learn as well as many fun and interesting facts. This DVD includes five delightful stories: Treetop Tom, Stripy Safari, King of Swing, Elephant Walk and Follow the Prints. SRP: $10.99. This DVD is now available atNCircleEntertainment.com or a retailer near you, including Target, Wal-Mart, and Toys R Us! The Cat takes Sally and Nick to Africa--where they learn how animals are either predators or prey, that elephants tend to favor one tusk over the other, how to tell the difference between a white and black rhino (both of which are gray! ), that a leopar'd black spots are called rosettes and much, much more! This book is packed with fascinating information about animals that you would potentially see in a real-life safari. 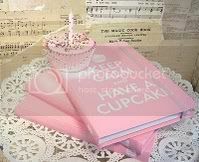 The book is very well written and engages the audience with its fun, lyrical rhyming. I highly recommend this book as a go-to story for children who want to learn about animals found in the African wilds. SRP: $12.99. This book is now available at seussville.com, Wal-Mart, and Barnes & Noble. (1) entry: Follow my blog publicly Google Friend Connect and tell me your favorite Dr. Seuss book. BE SURE TO LEAVE ME YOUR EMAIL ADDRESS! 5 entries - Blog about this giveaway. 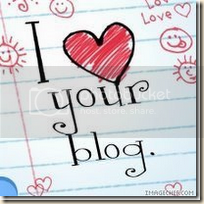 Link back to this post and leave the link to your blog post in your comment. 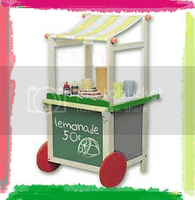 2 entries - Become a fan of Vanessa's Soda Fountain. Please comment TWICE for this entry. February is almost upon us. That means that Groundhog Day is only a few days away. We all know the legend behind Groundhog Day: if the groundhog sees his shadow there will be six more weeks of winter, but if he does not, there will be an early spring. If our weather-predicting friend in Punxsutawney, Pa. sees his shadow on February 2nd, Seattle’s Best Coffee will unlock 10,000 samples of delicious coffee to help lucky Americans get through the brutal, extended winter days. 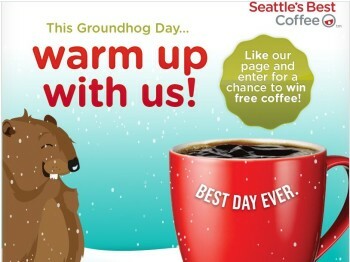 Seattle’s Best Coffee is eager to ease the sting of six more weeks of winter by offering free coffee to a lucky few if the groundhog sees his shadow. Winter weather watchers can cast their prediction and enter for a chance to win a free cup of coffee by registering on Facebook. Enter to Win Free Seattle’s Best Coffee® on Facebook! Those who want to join the festivities can visit Seattle’s Best Coffee’s Facebook page to register to win a free sample of Seattle’s Best Coffee and vote! If the groundhog does, indeed, see his shadow, those who register will be eligible to win one of 10,000 free samples of ground coffee* that brews a 10-cup pot of coffee. *Sample size is 1.75 oz of ground coffee. Seattle’s Best Coffee reserves the right to substitute coffee sample type. Seattle’s Best Coffee LLC has been roasting premium coffee since 1970 and today roasts more than 20 million pounds of coffee every year and millions of cups of our coffee are served every day. A freshly-brewed cup of Seattle’s Best Coffee is currently available in more than 50,000 locations including cafes, college campuses, restaurants, hotels, airlines, cruise ships, grocery stores and movie theatres. Seattle’s Best Coffee is a featured brand within Starbucks Corporation (NASDAQ: SBUX). For more information, please visit Seattle’s Best Coffee online at www.seattlesbest.com, become a member of the coffee community at www.facebook.com/SeattlesBestCoffee or follow Seattle’s Best Coffee on Pinterest for unique coffee inspiration at www.pinterest.com/seattlesbest. From now through Feb. 1, winter weather watchers can visit the Seattle’s Best Coffee Facebook page to register for the chance to win free coffee. No purchase is necessary. On Wednesday, January 16 at 2PM, Univision’s Lourdes Stephen will host Spanish-language “Virtual Workshop” for Look Good Feel Better®. LGF is a program dedicated to boosting cancer patients’ self-esteem and confidence through lessons on how to manage the appearance-related side effects of cancer treatment . The event will be streaming live here. You may register in advance for the event at this site. Ms. Stephen will be joined by beauty experts Lilly Rivera, makeup artist, and Petra Belen, hair stylist and Louanne Roark, Look Good Feel Better Executive Director, who will offer instruction, tips and advice – tailored to Latina women - for dealing with hair loss, changes in skin, complexion and nails during your cancer treatment, taken straight from the live LGFB community based group workshop program. Register now for this virtual seminar. LGFB also offers free workshops and educational resources that address skin changes and concerns, and offers lessons on cosmetics, wigs, turbans, nail care, and accessories, and wardrobe styling. Workshops are facilitated by 14,000 volunteer beauty professionals in more than 3,000 locations nationwide. During the past 23 years, the program has served more than 800,000 people with cancer in the U.S. and more than 1.2 million people with cancer around the world. The program is made possible in the U.S. through a collaboration of the Personal Care Products Council Foundation, the American Cancer Society, and the Professional Beauty Association. * 59,200 Latinas will be diagnosed with some form of cancer in 2012. * 1 in 3 Latinas will be diagnosed with cancer in her lifetime. * Breast cancer is the most commonly diagnosed cancer in Latinas, followed by colorectal cancer and thyroid cancer. * Even though Latinas have lower breast cancer rates than white women, they are more likely than whites to be diagnosed at a later stage, when the cancer is more advanced and harder to treat. * 37% of women in the same survey said that they avoided leaving the house because of the way that they looked during cancer treatment. Please spread the word about this amazing program. Telling someone you know about this program now or in the future could certainly be a breath of fresh air for them. Sometimes it is very difficult to have confidence or to feel beautiful when you are going through chemo or certain side effects of cancer. This eye-opening seminar and workshops that are offered will certainly be very helpful and comforting. Please register for the virtual seminar that will be held on January 16. Or, go to the site and learn how it can help you or someone you know. Tell your friends and family as well! 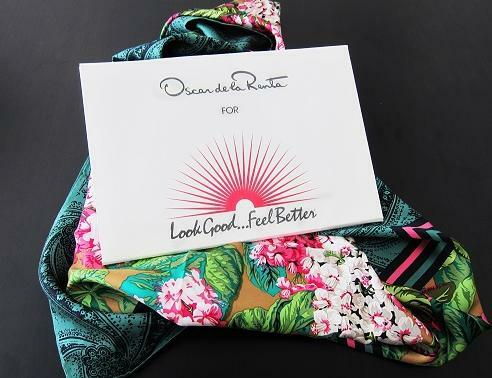 One winner will win a beautiful, limited edition Oscar De La Renta scarf. (1) entry: Follow my blog publicly Google Friend Connect and tell me how you have raised awareness of cancer. BE SURE TO LEAVE ME YOUR EMAIL ADDRESS!